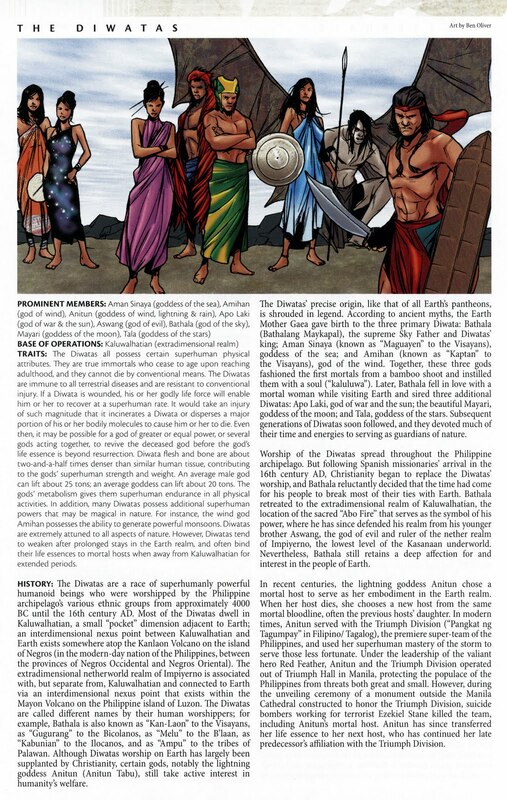 In honor of the Philippines's Independence Day today, I decided to discuss a couple of events that took place in Marvel Comics in the last couple of years. In The Invincible Iron Man #4 by Matt Fraction and Salvador Larocca, we are introduced to the Triumph Division, Marvel's faction of Filipino superheroes. These people then get blown up by a bunch of Buddhist monks, just so Matt Fraction can create a new version of the team in a couple of issues. Getting the horrendously photorealistic art out of the way - has anyone noticed how these days, "photorealism" means that the colorist does most of the work? If this were in black and white, the art would be horrible. - it is, I will admit, a nice thing to even have an attempt at being represented. As the world gets smaller, the Philippines has gotten bigger (the world's number one boxer is a Filipino, folks, remember that). And more importantly, due to the sheer number of incredibly talented Filipino artists who have worked in the American comics industry since the 1970s, it's nice to get some acknowledgment. But that's gone quickly, because this is one of the stupidest and most ridiculous scenes I could imagine being set in the Philippines. First of all, the Great Mongoose? What? Mongooses aren't indigenous to the Philippines. They do exist, but the majority of the Filipino masses don't even know about it. Next of all, Buddhist Monks? What? And they just approach the stage without security stopping them? I've lived in the Philippines for 22 of my 27 years, and I've seen Muslims, I've seen Protestants, and I've even seen Hasidic Jews, but I've never, not once, ever, laid eyes on a Buddhist monk, especially not in Makati, the city that I live next to and the city in which I work every day. Also, yes, a lot of Filipinos are middle-aged brown-skinned women. But not all Filipinos are middle-aged brown-skinned women. Honestly, that looks more like a group shot of the old people on my street than it does a representative view of people who would actually go to official events. And look at that "realism." UGH. That art is horrible. 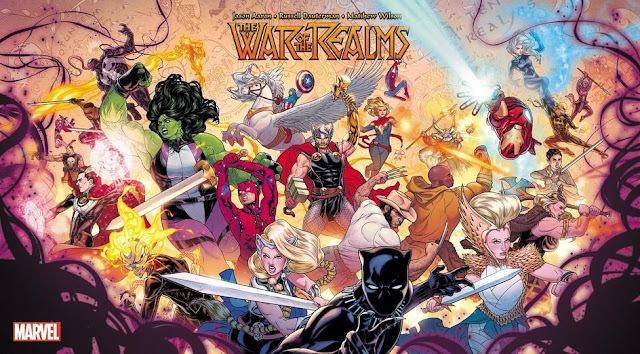 I don't even care that they look like the middle-aged people from my neighborhood, and therefore distinctly Filipino, it's this kind of art that kills comics. All the gesture is gone. Why don't we just take pictures and put them together as panels? 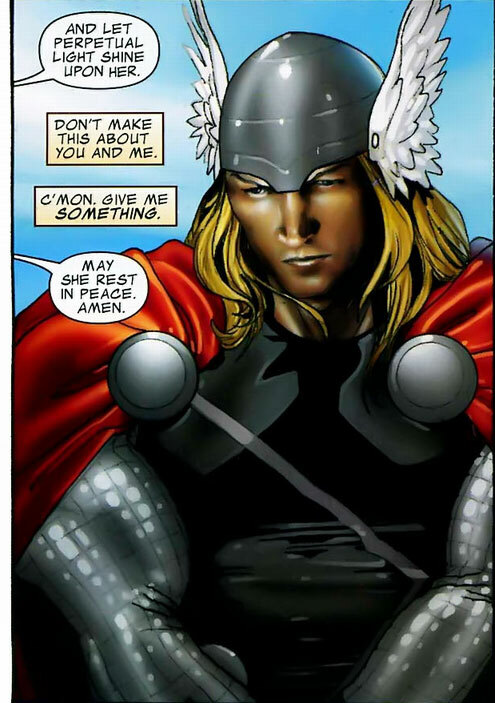 I mean look at Thor! SHEESH. Alex Toth must be rolling around in his grave. Getting back to the issue of accurate representation. Why does this matter to me? Because I believe that when you're representing minorities, you should accurately represent them. We are almost all guilty of the fact that we form impressions of a place based on what little we see in stories and movies. I can't count the number of Americans and Filipinos I've met who were surprised to hear that South Korea is a first-world country - somehow, they base it on what they think is Asia, they don't hear about it much on the news, and to them, it's a third-world country. I can't count the number of Americans I've met who think I speak Spanish all on account of my name being Hispanic. We do not have the time, none of us, to fully research on every culture and every country. It is the responsibility of the writer to accurately depict what is going on in the country he chooses to portray, because people will be reading these things, and for a lot of them, it will be the first exposure they have to such a culture. "Respectfully, I disagree. It wasn't poorly researched; I promise-- but it was written for a predominantly American comics audience, which resulted in me making some choices for ease-of-reading rather than absolute cultural accuracy. I made that call because I felt if I had to explain and contextualize things for every reader, it would've slowed the story to a halt. Were I writing a Filipino team for a Filipino audience it would have been different. " This is, quite frankly, ridiculous. Writing something for ease-of-reading of a predominantly American comics audience disregards and overlooks the considerable audience you have in other places -- like here in the Philippines, where off the top of my head, I can name eight big comic book shops and five bookstores with profitable comic book sections in the same Metro area. Even then, your writing it for an audience that is not of the culture that you are portraying is even more reason to do it accurately. You're the writer, you have the power to affect knowledge, and you have the responsibility to make sure that people come out of it with the right knowledge. Whether or not you realize it, you as a writer have great power. And we know what that brings with it. "I know Mongoose aren't indiginous to the Philippines, but they ARE there, and had i time and space to talk about the character, I would've and i think it would've made sense (it's a reference to his kung fu fighting style, but how do you casually bring that up at a ceremony like that?). St. George I disagree with-- as a judeo-christian and catholic icon, I think that's an appropropriate name, especially for the religious makeup of the country." First of all, I want you to find 100 random Filipinos, and then see how many of them know the story of St. George. You'll be lucky if you get 15. Second of all, you as a writer have a responsibility to not mislead the audience when it comes to things like culture and national facts. When you come up with an American hero named, for example, "Tiger Mask," for your "primarily American comics audience," you are saying that it's just a name. But when you come up with a Filipino hero named "The Great Mongoose" for your "primarily American comics audience," you are actually leading them to believe that mongooses are native to the Philippines. Which they are not. The rest of the world - minority, third-world countries, especially - do not work in the same way that America does. "I know there's been issue with the use of the faux-Buddhist/Krishna-ish monks in the scene, but as the Philippines is mostly Roman-Catholic, I wanted to pick a visual signifier for a religion and a religous group and its practitioners that, in both countries (the US and the Philippines), indicated a signifigantly small minority. To dress the bombers in a way that immediately suggested a devout religious group, and a somewhat.... not necessarily mysterious, but an exotic one. they were SUPPOSED to a startling and rare group of people, which is exactly what they were." FILIPINOS! Quick! Raise your hands if you think that seeing a group of Buddhist monks in ROBES at a government function is mysterious? Yes? I thought so. And again, when you do this in America for your "predominantly American comics audience," you are showing that it's a "significantly small minority." When you do it in the Philippines for your "predominantly American comics audience," and not even say in the running text that the Philippines is a predominantly Catholic country, you are giving off the impression to people who don't know any better that Buddhist monks are common in the Philippines. And I lived in the US and have a lot of American friends, sir. I know the effect of these things. "(this issue saw the first real editorial content note I've ever received: in the inital drafts of the script, the monks were children. the bombers were supposed to be nearly a-religious...)"
That would have been better. No one's going to actually think any country is full of children who go around bombing people. I hope. "I talked to a couple Pinoy friends, both here and in the Philippines (at one point even toyed with doing the whole scene in Tagalog) about the characters and the scene and felt comfortable with the way it ran. The mongoose was the one issue that came up and it was one that I chose to make (ultimately, it's a name, and just struck me as-- well, a name. Is "Green Lantern" too American a name? Etc. etc.). The rest I'd argue with similar to how I have here on the basis factual or artistic decisions." A lantern is an inanimate object that can be found anywhere in the world. A mongoose is an animal that is not native to the Philippines and is not an animal associated with the Philippines. There is a huge difference. That's on the same line of reasoning (though not the same level) as Ian Sattler addressing the question of racism in DC Comics with "we have green, pink, and blue characters." I wonder how many kids are now going to grow up thinking that the Philippines is that place where the mongooses and Buddhist monks are abundant. This treatment is rather excellent reworking of our old myths. I particularly like how they made Kaluwalhatian (meaning eternity, or heaven) the dimension from whence these gods come. Everything else seems to be a nice, contemporary rendition of our old myths. Quite excellent. I can't wait to see it in an actual story. Yep, that weirdness also struck me when I read that comic. Maybe it's an alternate-universe Philippines. I just thought the comic was bad to begin with, but the sheer inaccuracy - and INTENTIONAL, at that - is what really set me off. There are mongooses in Palawan. True, but that's not the contention. The contention is that it's not an animal that one associates with the Philippines - it's an animal that the majority of the Filipino masses don't even know the existence of. In short, it's not a symbol of the Philippines, and it's hardly abundant. Hell, a bearcat would have made more sense, only barely. Fraction's treatment is such that it would make people who don't go to the Philippines think mongooses are everywhere (and that St. George is a national hero, and that the only people in the Philippines are middle-aged brown-skinned women -- and by the way, did anyone notice that while everyone in the audience was brown-skinned, all the superheroes were pale? ), which is my point. And even then, there are all those other points that Fraction (intentionally) missed. To write for a predominantly American comics audience is to ignore your other audiences. To intentionally skip over accuracy that could mislead your "predominantly American comics audience" is irresponsible. I get that Fraction was plain wrong on a lot of calls. I'd prefer to have exploding nuns, for one. So yeah, that Iron Man story arc was fun but Buddhist monks were stupid. But on the single point of the Great Mongoose, I didn't think there was anything off with his inclusion since, yeah, there are at least mongooses here. Beyond that -- even as a member of the premier Filipino team of the Marvel U, he's no more obliged to be a symbol of a national animal than Spider-Man or Black Canary or Ant-Man or Wasp are for being in the Avengers. I get your point, really, I do - but my point is about public perception and how, based on my own experiences abroad and here, it is so easy for one thing to shape and define what other cultures think of other cultures just by depictions given in popular culture. Didn't our nation go up in arms a few years ago because of some line Teri Hatcher gave in Desperate Housewives about us having crappy doctors? The reasoning being that it's easy for us to be construed as having crappy doctors - despite the fact that we produce some of the best doctors in the world. So I think the mongoose thing - when there could have been a lot of other, better choices - is still evident of a wrong call. Certainly though, us arguing over the one thing while agreeing that Fraction (and LaRocca, for that matter) made a lot of wrong calls is nitpicking! But I do understand your point of view! I find the second part of your post interesting because that's pretty much the second time local Pinoy folklore was ever mentioned (correctly) in popular fiction. now i'm intrigued as to how that'll all play out. The second? When was the first, sir? The B'laan deities were used by poet Angelo Suarez as a topic for one of his poems. Sorry, I made a mistake in my previous post. I should have said "popular literature". there are buddhist monks in the philippines. the philippine culture also has its history in buddhism dating pre-spaniard colonization. buddhism, though it may be a small minority within the philippine population, is not a mis-representaion. im am one of the few who was forturnate enough to be born filipino & buddhist. Putting them in as the one religious sect that is there and not classifying it in the text as being out of place (when was the last time you saw Buddhist monks at a public ceremony?) is a misrepresentation. There are Filipinos in Easton, Pennsylvania, but if you wrote a short story in which Filipinos are in Easton, Pennsylvania, and you don't make it clear that they're a very very small minority, a reader who knows nothing about Easton, Pennsylvania, will automatically think that Easton, Pennsylvania, is a town full of Filipinos. I'm glad I caught this conversation. First off, I am a Filipino American, also born into a Filipino Buddhist family ( & not by Chinese roots). The last time I had visited the Philippines I was one of the attendees of a public ceremony celebrating Vesak (Buddha's Birthday) at the Great Mall of Asia. Filipino monks? Yes, they exist. Were they present at the time? Yes. Was this a Public ceremony? Yes. This was circa 2008, and I notice this forum is around 2011. So if you ask me whens the last time I have seen Filipino Buddhist monks at a public ceremony, well there you have it pare. Is it common? Probably not, but it exists. I also do not believe that the every day reader of Marvel comics, will see such representation of Filipino Buddhist monks as this, and make the judgement that Philippines is a completely Buddhist country.If they happen to be a Filipino reader, I might add, they will have to be a little ignorant as to state that " HEY we are not Buddhist! ". "We" implies everyone, and not everyone is Christian (or any of its denominations) in the Philippines. I believe if anything that the Buddhist's and Muslims are under represented minority in the Philippines, and for them to get a little spotlight is pretty cool to see. Just because someone is part a minority, does not mean they can NOT be represented. It by no way falsifies a particular religion in the Philippines, just because it is not predominate throughout. Now Duy, it may be just me, but it seems to me your a little irked/bitter at the fact that the majority was not represented or stated. Well, that is just too bad. Imagine the representation the minorities get, yeah you guessed it, not much. So for them to get a little acknowledgement in something as small as a comic book, I do not see the problem. Next time I see anything Buddhist in a comic, I will hope they state the religious statistics of that region/country, just to make sure no one "gets it twisted". Majority must be ALWAYS be represented and minorities should never have their day! Hah. Hi Nick. Thanks for your comment. I was (this was in 2011 after all) more irked at the execution, and nothing to do with the majority being represented. If that were true, I wouldn't have written "Also, yes, a lot of Filipinos are middle-aged brown-skinned women. But not all Filipinos are middle-aged brown-skinned women." Brown skin being the only majority aspect in that list, I would have liked to see more of a variety. I never said Buddhists didn't exist in the Philippines, and I'm surprised at the number of comments I've received, both here and offline, that bring that up. I didn't say they didn't exist. What I said was that I had never seen them (up till that point; I have since then) and that they weren't common (which is still true). I absolutely agree with your overall point that having a more detailed, nuanced representation is important and that we should strive to have a balanced view, but Buddhists in the Philippines in an American comic book with an American protagonist is a minority within a minority. Fraction's intent was to show that Buddhists were mysterious and out of place, but he did not once say in the running text that the Philippines was a predominantly Catholic country. The Philippines wasn't (still isn't, but progressing) well known and people aren't so well-informed about it, so without that bit of information, how is any reader who doesn't have a passing knowledge of the Philippines supposed to pick up on the Buddhist monks being "mysterious"? They approach the stage with no one making any comments, AND there are no other religious denominations represented in that scene. As I said, people tend to generalize, especially when they don't know about a place very well. My first name, my real name, is Hispanic in origin, and I'm from the Philippines. As a result, when I lived in the States, "So you speak Spanish?" came up a lot. And this wasn't in the boonies or anything; this was places like Washington DC! Now, that's not to say that no one the Philippines speaks Spanish. All I'm saying is that it misrepresents the, shall we say, proportion. Not the mere fact of existing. It's easy to project, from what we see, onto a whole population -- since starting the Cube, I've actually received comments, not from Filipinos obviously, that asked how I speak English so well. I mean, that's always been there ever since my time in the States, but now there's "How do you speak it so well, because the only Filipino I ever heard talk was Manny Pacquiao." Mere anecdotal evidence that causes me to have a bias in terms of more accurate, and perhaps, in the case of the Philippines, majority sampling? Maybe. I definitely would like a more rounded view in my fiction, but I also want it to communicate with a certain degree of accuracy. I participated in an imbango a few years ago when I went up north to the Mountain Province, with native dances and carabao-slaughtering and pig-carrying and everything, but I'm quick to say, when I tell that story, that that's a custom, and that yes, people use computers and have the internet and don't (all) live in nipa huts, because I know that the moment I start saying the words "We were in bahags", most people form an image in their minds and that image is, sadly, a quick generalization. Again, I didn't say Fraction couldn't use Buddhist monks. I didn't say Buddhist monks didn't exist in the Philippines. I said that when you show Buddhist monks at a public event without even once referencing other religious denomination, it leads to a lot of people forming generalizations, because that's what people do. And again, Fraction wanted to use them specifically due to the fact that they were a minority, but nothing in the story exists to indicate them as such. The same story could have been told, using Buddhist monks, with more nuance. Would you have commented if the they were priests instead on monks? Probably not. If they were priests instead of monks would you have called for referencing of the other Filipino religions? Id assume no. Is it factual that Filipino monks are around in the Philippines. Yes this is accurate. Would I comment on the issue if this were priests being represented? Of course not. Why? Because it is a part of Philippine history and is accurate representation. So is that of the monk being represented. So take a moment to think on that right there.
" I said that when you show Buddhist monks at a public event without even once referencing other religious denomination, it leads to a lot of people forming generalizations, because that's what people do." I agree with you. But as I said above would you have done the same in the case of Priests being represented instead of monks. Probably no because this is, whether you like to see it or not, is a Majority case. The fact that a Buddhist monk was represented, and not a priest does not sit well with you because you are a part of that Majority. Practicing or not. This in itself, leads to a generalization of all Filipinos are Catholic or within the Christian denominations. "As I said, people tend to generalize, especially when they don't know about a place very well. My first name, my real name, is Hispanic in origin, and I'm from the Philippines. As a result, when I lived in the States, "So you speak Spanish?" came up a lot. And this wasn't in the boonies or anything; this was places like Washington DC! " Everyone of us Filipino Americans go through this. Each and everyone of us is guilty of doing the same to our own kind. I have a Hispanic first and last name. San Juan being my real last name. I've mistaken other Filipinos as mexican or even other hispanic races, and they have thought the same as me at times. This is not just an American misunderstanding, but a Filipino one as well. Last name, and physical attributes alike! And Id like to apologize for my use of "exist" in the last comment. I merely tried to convey the fact that they were around. You do not need to see something to know its there. Born and raised in America, and I know mountain lions exist, but I have never seen one. "The fact that a Buddhist monk was represented, and not a priest does not sit well with you because you are a part of that Majority. " You're free to keep ascribing motivations that aren't there to my statements , Nick, I'm not going to stop you. I've already explained above and in previous comments that I was commenting on the tendency of any culture that doesn't know anything about another to generalize based on what is represented. Generalization as a whole isn't a good thing, but even on a technical level, Fraction stated that he wanted to use a denomination that's a minority, to be startling to people. Do you think that was clear to anyone who's coming into this without the knowledge that the Buddhists are a minority group?